I had a packet of Uncle Bens Express whole grain Mediterranean rice in the cubhoard a few peppers and some remains of my veg box. I chopped up an onion and half of a courgette which I had left and some mushrooms a few fresh herbs ( I had Basil, oregano and mint) I added a clove of garlic minced up and some torn up spinach leaves. I would have added some chilli pepper but toddler was having this too. I stirred in some olive oil and mixed it all together. Loaded it into halves of Red and Green pepper. 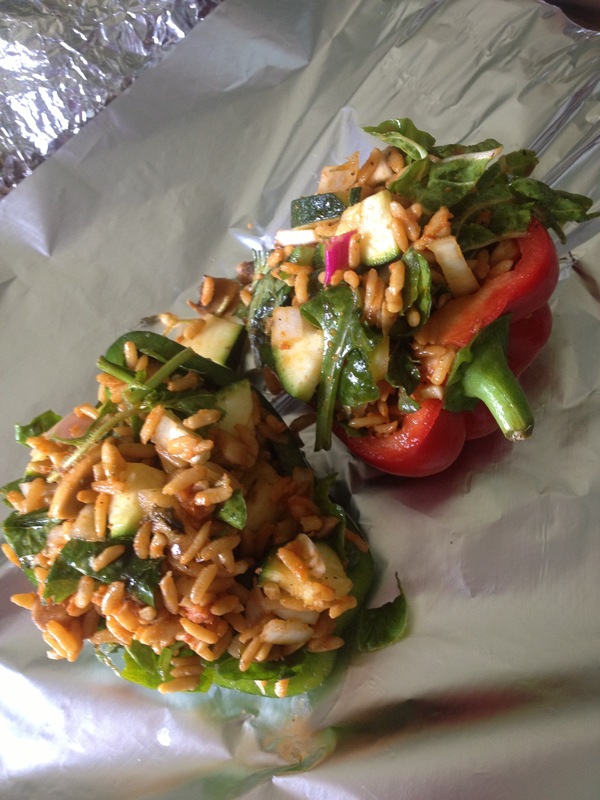 Wrap in tin foil and bake in the oven. For the last 15 mins of cooking open up the tin foil sprinkle with cheddar cheese and let that melt. You could even do this on a barbecue!